The Old Presque Isle Lighthouse is located one mile from the 1870 Light Keepers Station. The site is open for tours and tower climbing from June through September. On July 5, 1838, Congress appropriated $5,000.00 for the first Presque Isle Lighthouse, a year after Michigan gained statehood. On July 10, 1839, an advertisement for proposals to build a lighthouse at Presque Isle appeared in the Detroit papers. 1839 “Lighthouse Reservation” surveyed by A.E. Hathon during the 3rd quarter. Later surveys would show that the point opposite the lighthouse property was the center of activity on the harbor during this era. Only two roads in the area were indicated, both led to a wharf on the point, one from the south along the west shore of Lake Esau and the other from Grand Lake. On September 4, 1840, John Scott certified the lighthouse completed according to contract. On September 23, 1840, Henry Woolsey was appointed Keeper with an annual compensation of $350.00. In 1868, due to deteriorating conditions of the keeper’s house, new plans were drawn to rebuild the house and attach it to the tower. However, the plans were never used. It was determined that the Old Presque Isle Lighthouse was not an adequate aid to navigation and in July, 1870, Congress appropriated $28,000.00 for a new lighthouse at the north end of the peninsula. The last keeper of the old lighthouse was Patrick Garraty Sr., he was appointed by Abraham Lincoln. In February, 1871, notice was given to mariners of the new lighthouse. Patrick Garraty Sr. moved from the old harbor lighthouse to the new lighthouse. In 1871, the old lighthouse was decommissioned and in 1897 it was sold to the highest bidder, E.O. Avery. After a few years he resold to General Duffield who owned it about a year until purchased by Bliss Stebbins. In 1930, Bliss Stebbins sold the property to Francis B. Stebbins. Due to deterioration of the dwelling it was demolished and rebuilt on the same foundation in the late 1930’s. Francis died in 1969 and the property was willed to his son James Stebbins. In August, 1961, a surplus lens was purchased by Francis B. Stebbins. Fred May of Grand Lake constructed a lantern room which was hoisted into place atop the 1840 lighthouse. The revolving 4th order lens was most likely removed from South Fox Island in Lake Michigan. On June 19, 1965, a State Historical Marker for the 1840 Lighthouse was formally dedicated. 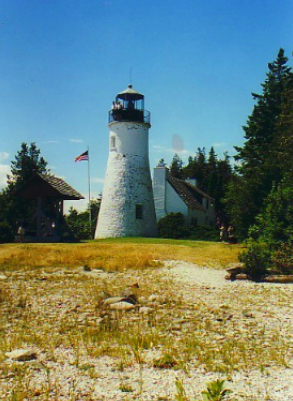 In 1995, with the assistance of the Michigan Natural Resources Trust Fund and private donors, the property was transferred from the Stebbins family to the Presque Isle Township for a lighthouse museum and park.